HyLite LED Lighting is excited to introduce a new Plug-in LED lamp for downlighting applications. With its compact size, the new HyLite LED VL lamp efficiently delivers illumination at 116 lumens per watt with a 120° beam angle. At only 12W, the HyLite VL Lamp replaces up to a 42W CFL, effectively reducing energy consumption by up to 71%. 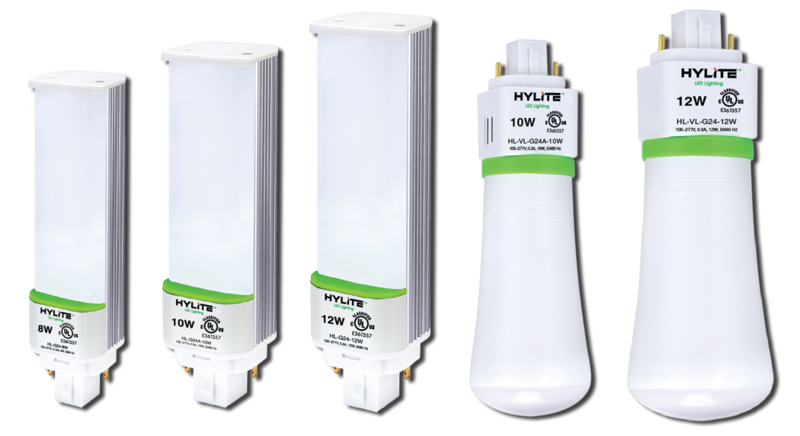 Designed for reliable performance, the HyLite VL lamp, with a rated life of 50,000 hours, last up to 7 times longer than CFL lamps. The lamp operates on 120-277V, allowing for the CFL ballast to be removed from the current system. Removing the ballast minimizes energy consumption, eliminates an additional point of failure while decreasing continuous costs of repurchasing ballasts & the labor to change them. By reducing the frequency of regular lighting maintenance, the HyLite VL Lamp is a great solution for areas where lamp change-outs are difficult, inconvenient, or costly. FCC compliant, the HyLite LED VL Lamp does not cause or emit any harmful EMI or RFI interference, making it an ideal energy-saving lighting product around sensitive equipment, and in applications such as hospitals or airports. Unlike CFL lamps, the HyLite VL lamp is shatterproof and does not contain any mercury or hazardous metals. There are no disposal requirements. The HyLite LED VL Lamp comes with a 5-year limited warranty. For more information on the HyLite LED VL lamp, please visit here. HyLite LED Lighting prides itself on designing innovative and cost-effective lighting products for commercial and industrial applications. HyLite is dedicated to the preservation of our planet by offering eco-friendly, energy-saving LED lamps, retrofits, and fixtures. For more information, please visit www.HyLiteLEDLighting.com, email info@arva.us, or call 803.336.2230.